It’s been said that there’s no such thing as a free lunch, but who needs to eat when Epic is handing out free Battle Pass Stars in Fortnite Battle Royale? The “appreciation gift” is the studio’s way of apologising for last week’s extended downtime that players experienced across several platforms on the absurdly popular free-to-play battle royale game, and are available to anyone as part of today’s 3.5 content update, which is now live. Just log in to the game anytime, and you’ll be instantly gifted with 20 free Battle Pass Stars, which equates to two tiers in the game’s Battle Pass progression system, but that’s not all that’s included with the latest update. For one thing, the sky is literally falling, as comets can now be spotted soaring across the air at random intervals during matches, and that giant meteor that’s been around for the last few weeks has got even closer and bigger. What’s more, data miners have discovered that a new Solo mode called “Impact” is coming to Fortnite Battle Royale next week, which is just one more clue to suggest that the final update for Season 3 will bring the apocalypse to the game in some form or another. Will players have to be dodging comets while questing for Victory Royale by next week? We’ll know soon enough. Today’s patch also brings the new LMG weapon to Fortnite Battle Royale’s matches, which bears a rapid fire rate and large magazine size that makes it perfect for spraying and praying during those intense late game firefights. It comes in Rare and Epic rarities, fires medium ammo, does 25 to 26 damage per hit, and can be found in chests,and vending machines, or just lying around the landscape of the map itself. Lastly, the rebooted and resuited 50v50 mode has finally gone live in the game, after being delayed for two weeks once Epic realised it wasn’t quite ready for public consumption. The mode pits two teams of 50 against each other, both dropping from their own separate battle bus in matches with increased loot spawns, faster storm circles, and more ammunition. You can read all the juicy details of the 3.5 Content Update in Epic’s patch notes right here, but the game is already back online and playable now that the planned downtime is complete, so just check out all the new stuff for yourself by booting up the game and hopping into a match forthwith. 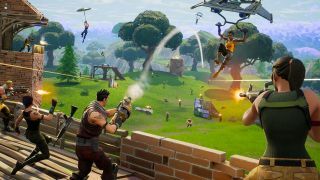 If you’re new to the game, swot up on our best Fortnite tips to learn every tactic you need to score that epic Victory Royale.